While Lan Fong Yuen claims to be the original Hong Kong milk tea, it certainly isn’t the only one serving this local treat. We decided to try another stop on the Curry Puffy Culinary Crawl and breakfast (twice, in fact) at Tsui Wah Restaurant. This chain might be compared to a Denny’s in the United States, but without intending the unspoken insult that lies in the comparison. 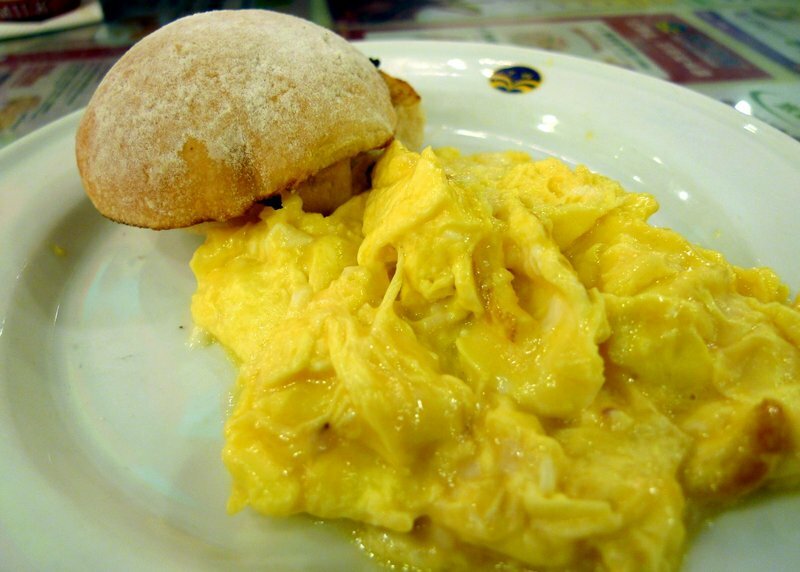 Tsui Wah serves basic Hong Kong comfort food at all hours of the day from a number of clean, efficient locations. 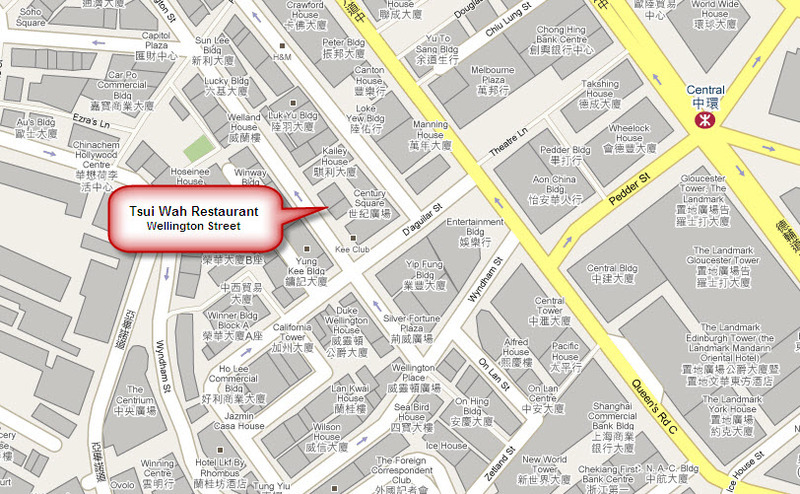 We decided to visit the one in Lan Kwai Fong, just above Central and a stone’s throw from Lan Fong Yuen. The first visit was in the early morning, when only the limited breakfast menu was being served. The second visit the next day was later in the morning, when more lunch-like items were available. 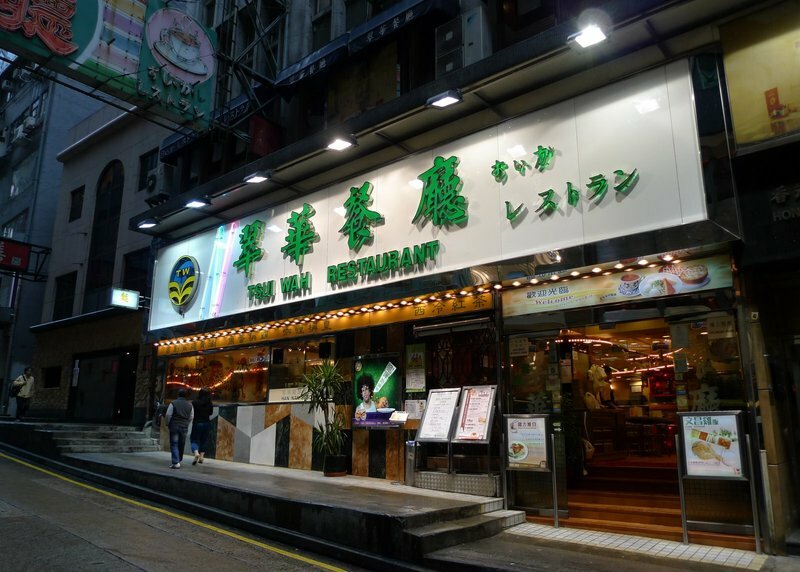 As you walk up D’aguilar Street from Queens Road it should be easy enough to find Tsui Wah. Just follow the large green sign and make a right turn onto Wellington Road as it indicates. It was a drizzly morning when we first arrived and being damp, we were looking for something warm and comforting. The dining room (multiple stories at this location) is bright and a bit madcap in its interior design. The menus are under the table glass with helpful pictures and English translations (which aren’t always super-clear but you’ll figure it out). The milk tea arrived in this cup and saucer, branded with a local evaporated milk brand. I have to say that between the two milk teas, I found Tsui Wah’s a bit more bitter and spicy. I preferred Lan Fong Yuen for its gentler flavor. Breakfast was, in a way, not very Hong Kongese. Yes, that is a bowl of oatmeal. And after four days of not having my daily bowl of oats for breakfast, I was sorely missing it. The rolls are a toasted “pineapple” bun (nothing pineapple about it that I could discern) that has butter and condensed milk on top. Very chewy texture, like a Kaiser roll. Not a fancy breakfast but cheap and tasty. Tawn felt the buns were better here than at Lan Fong Yuen. The second day I ordered a breakfast set that came (to my surprise) with a side of two scrambled eggs and a toasted roll. Simple food, right? But really, really tasty eggs. 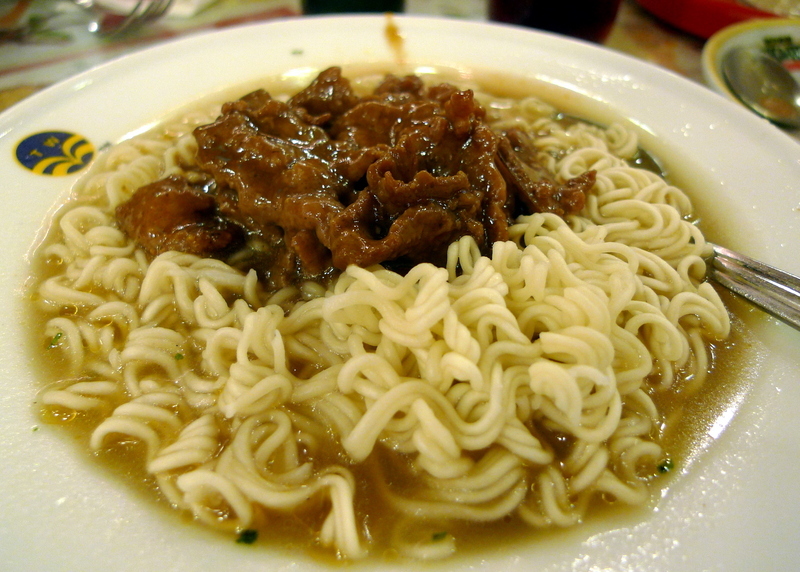 The second part of my set, what I actually was focused on, was a beef stew over instant noodles with soup. 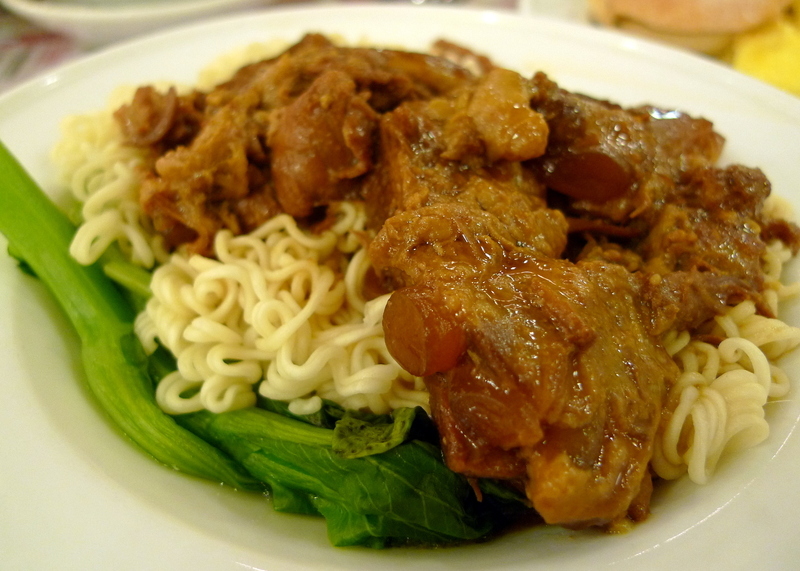 Tawn had braised pork cartilage over instant noodles with greens. The conclusion for the second meal was the same: simple and satisfying. Immediately across the street from this location of Tsui Wah is the world-famous Yung Kee Restaurant, which specializes in roast geese. While I didn’t eat there this trip, I have several times before and can also recommend it. Bring a group, though, as a little roast goose goes a long way. 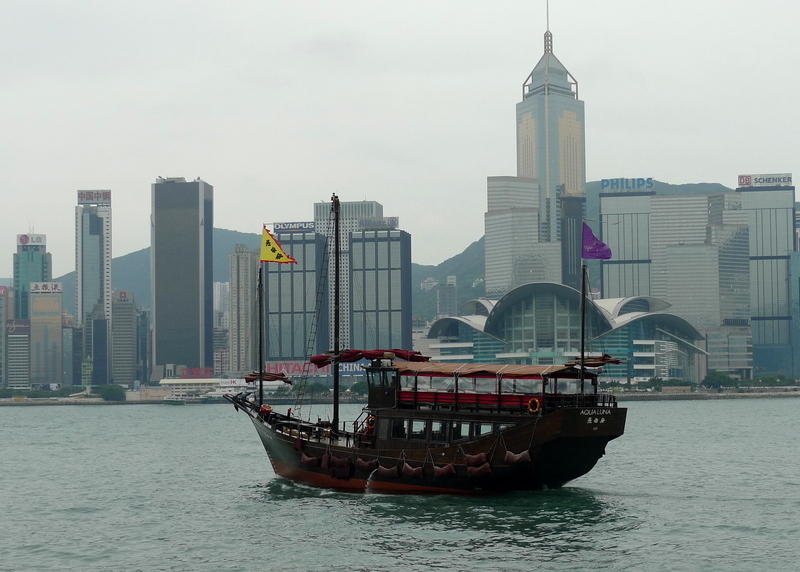 Two other sites from Hong Kong: Aqua Luna, the junk that you can sail on for a harbour cruise with cocktails. One of these years I’m going to book one of their just after sunset cruises and enjoy a bottle of bubbly while the lights come on along one of the most magnificent skylines in the world. 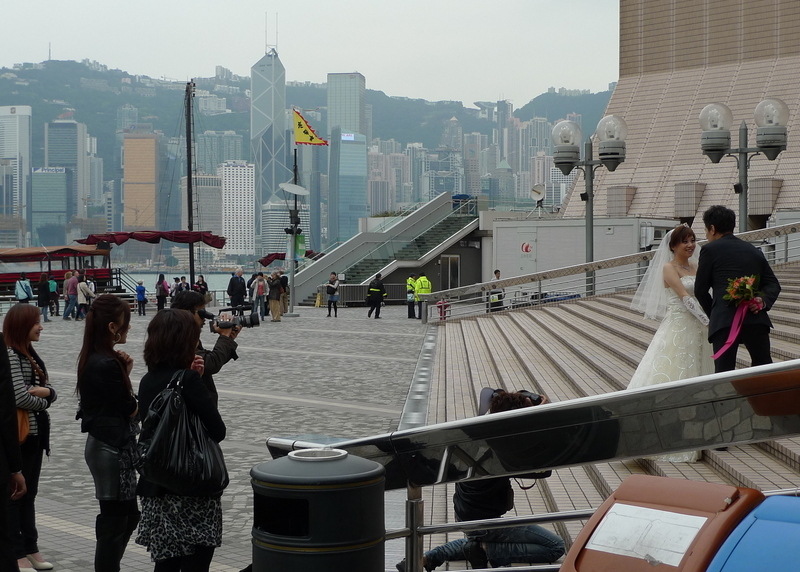 On the Kowloon side at the Science Museum a bride and groom posed for their wedding pictures, probably a few weeks in advance of their actual wedding day. Here’s to the happy couple! Regarding the rest of the Hong Kong trip, Tawn and I have been back in Bangkok since Saturday. I’ll continue updating on food in Hong Kong as I have two or three more meals that need to be documented. Then we’ll return to the regular programming. 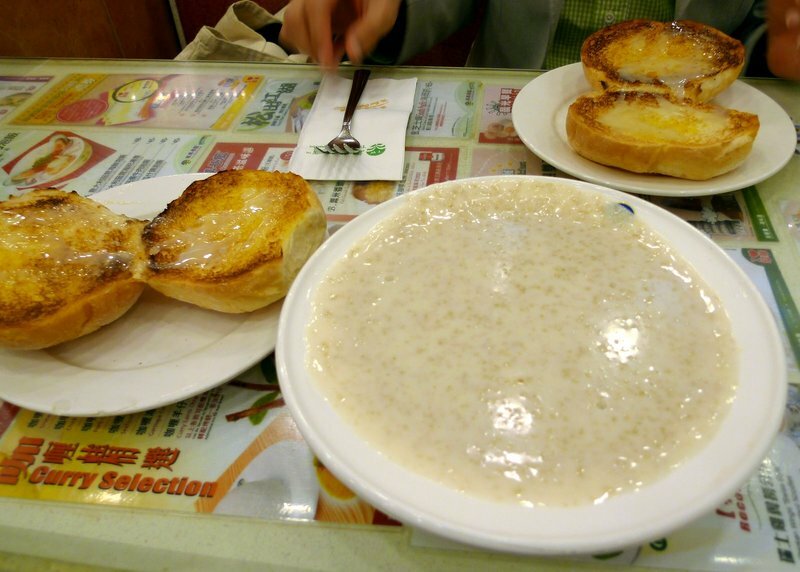 This entry was posted in Uncategorized and tagged Dining, food, hong kong, Tsui Wah by christao408. Bookmark the permalink. That braised cartilage looks so good.It would be awesome to have some bubbly on the cruise! @yang1815 – A bottle of bubbly sounds good to me too! Yung Kee is our family staple. When I was young, my mom would sent maid to get food! Even now, when I enter that restaurant, the receptionist and the elevator lady would recongize me and tell me where my mom is sitting, lol. 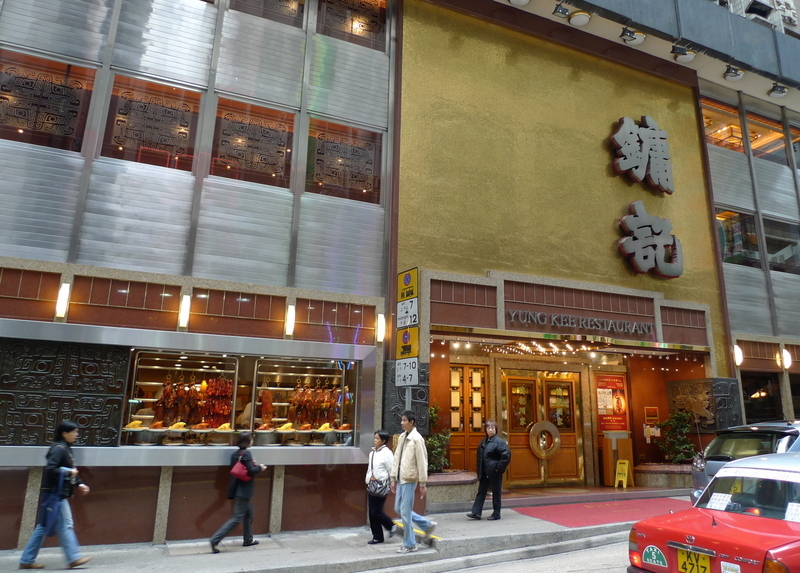 By the way, Tsui Wah are sometimes frequented by HK movie and TV stars. Glad to know that our own Xanga stars, Chris, Tawn and Gary eat there also. it’s called pineapple bun because the sweet crust on top is scored to resemble a pineapple. everything looks so yummy! @CurryPuffy – How often do you go back to HK? I wonder why the milk tea tasted bitter. You know that in India and all indians any where in the world, have tea with milk always. Very nice pictures Chris. 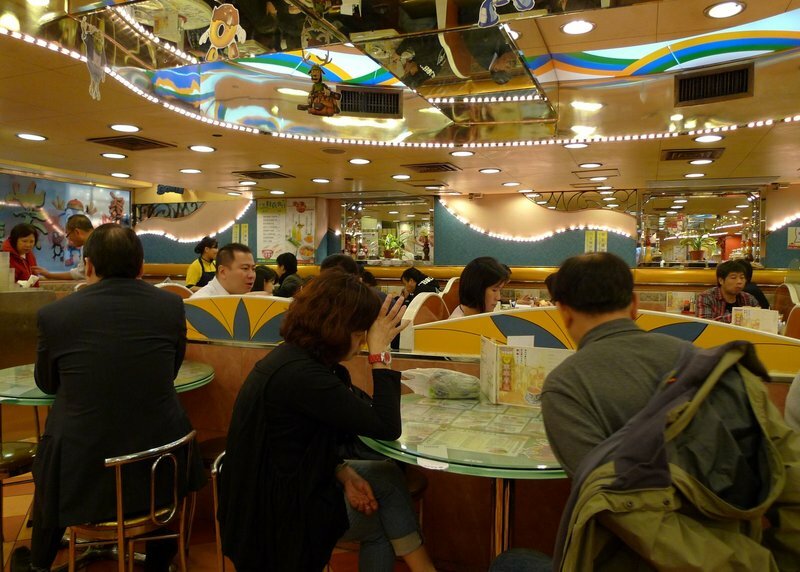 wow…Tsui Wah…my usual hang out place…! Why are instant noodles used so much? I **LOVE** instant ramen, but it’s so bad for you! I think the eggs looked just the way I like them but the oatmeal looked anemic! I think Tawn’s braised cartilege looked better than the beef stew. How did it taste? @murisopsis – All were very tasty, actually. The beef stew didn’t look pretty because I had soup with the noodles, whereas Tawn had his noodles dry. The oatmeal was actually excellent, very rich as the oats had been simmered in milk in a big kettle for hours. @Senlin – Because they are fast…@agmhkg – Had you not been renewing your ID card, we might have run into you there. @ZSA_MD – I think it was just the type of tea. I know I have some tea from Sri Lanka that has a spicier flavor profile, almost coffee-like. @sandelion23 – Well, that makes plenty of sense. I should have thought of that! @stevew918 – How great that you are still recognized! @CurryPuffy – Actually, it was two consecutive mornings. Up next is West Villa, actually. We’ve already done Agnes B. @ElusiveWords – Doesn’t Beijing have the largest Chinatown? =D@yang1815 – Sounds good. When? @Senlin – I just love the salty broth and the curly texture of the noodles. But you’re right, it’s bad. @ElusiveWords – As Julia Child said, all good things in moderation, including moderation. Oh, I think that a boat ride at sunset in Hong Kong would be amazing. They have such a cool skyline! @christao408 – We will have to see. 2011 some time? @agmhkg – I’m sure we’ll get over there sometime in the next year as it is both close by and one of our favorite cities. We’ll meet then! @TheCheshireGrins – It is pretty amazing, yes. @yang1815 – 2011 sounds good to me. I know I’ll be in the US sometime around July although not 100% sure. Other than that, no 2011 travel plans yet. @christao408 – Alrighty! Let’s do it! @christao408 – oh! hahahah, that’s the first time i’ve heard of that, even though i watched that movie!i am so hungry now…. oh i have a great apetite… can’t wait to eat in the morning..
@stepaside_loser – I don’t know if it was in the movie but she said it in real life, certainly. AHH!! I went to Central last time and I can recognise the second picture. 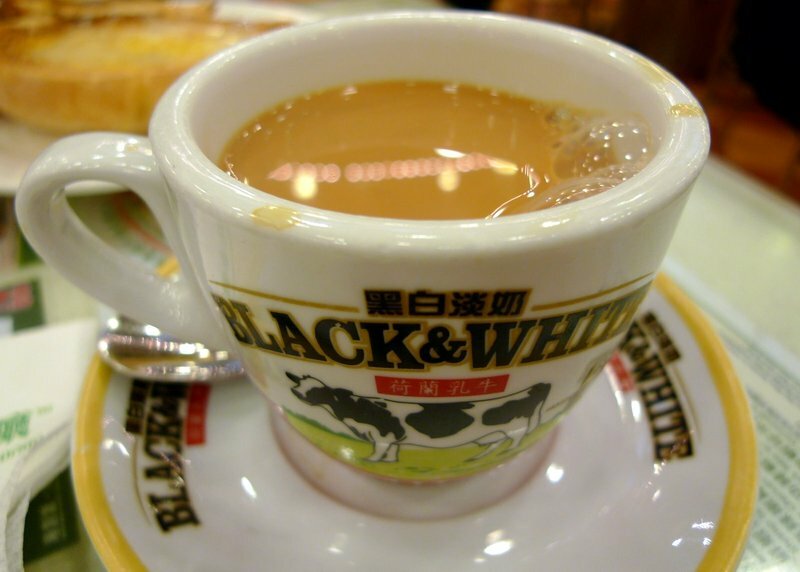 I like HK coffee and milktea. It taste different to ours in oz. I’m feeling ‘home sick’ even though I was born there. 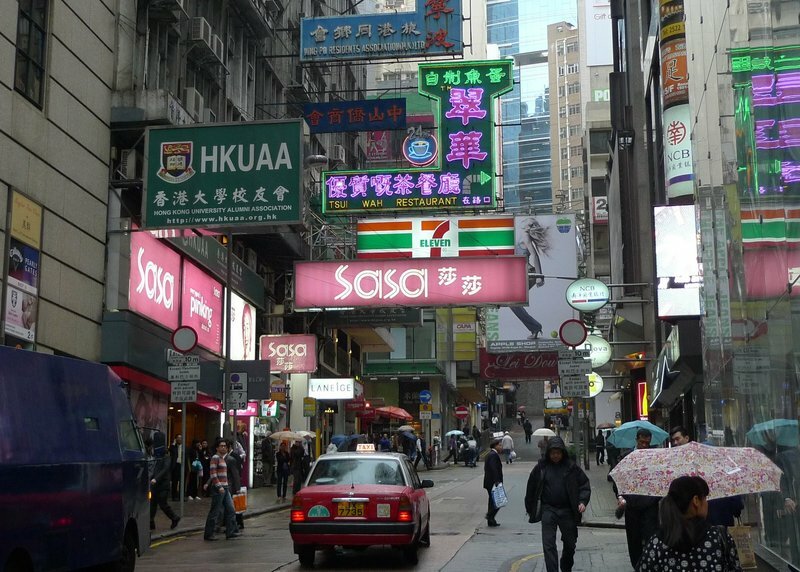 @Got_Takoyaki – Oh, that’s a pretty well-known street in Central, isn’t it?